Scientific Journals and modern research have proven that Chiropractic Adjustments are the best at reducing or eliminating pain when compared with other forms of medical treatment. Although the purpose of Chiropractic care is not to simply remove or reduce pain, it is certainly a great side effect. The research shows that Chiropractic Adjustments are better at pain relief. Pain begins to dissipate when the brain no longer perceives an adverse condition. Pain is felt in the brain, not the body, and understanding how pain originates becomes a key element in its elimination. But alleviating pain begins with finding the cause. Although simple in principle, millions of people every day seek to treat and mask symptoms of pain rather than the origin. 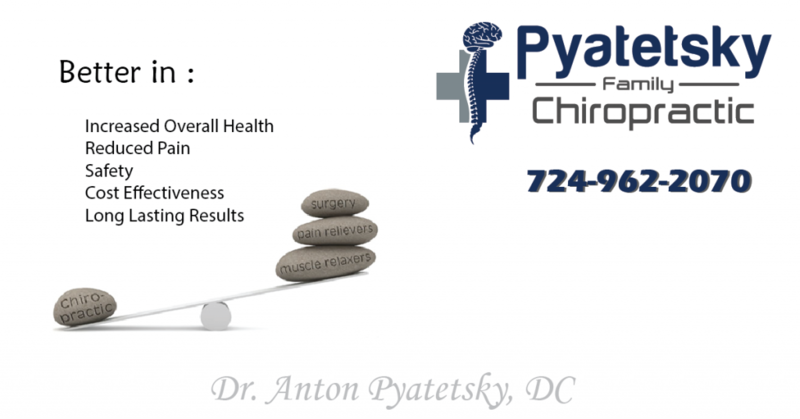 Chiropractors like, Dr. Anton Pyatetsky, DC seek to find and address causes rather than effects. The Journal of Spine serves as one of the greatest medical reference publications available. The research compared three different forms of treatment for chronic spinal pain sufferers. They compared Non-Steroidal Anti-Inflammatories (NSAIDs Vioxx and Celebrex), and Chiropractic. The results surprised the medical community and brought clarity to the mission of Chiropractors seeking to help people understand the benefits of regular adjustments. The results of this particular study revealed that Chiropractic adjustments alleviated pain five times better than medications. The patients assigned to the group receiving Chiropractic care had experienced chronic pain for almost twice the amount of time as the subjects in the other two groups. Therefore, Chiropractic helped the people with the worst pain get better quicker than medications. Another important point of the study reported that 47% of the subjects receiving Chiropractic care had an improvement in their overall health while 18% in the drug therapy group. Chiropractic long ago advocated many more benefits than simple pain relief. Improvement of the nervous system translates into a body empowered to improve overall health. According to another study published in the Annals of Internal Medicine, medication is not the best option for treating Neck Pain. Chiropractors specialize in locating and correcting small misalignments in the spine that interfere with the central nervous system. Adjusting subluxations produces the wonderful side effect of pain alleviation and removed. The Journal of the Spine study serves as one of many professional health studies that prove the powerful benefits of a well-functioning nervous system through Chiropractic care. Unfortunately, much of the public remains unaware of the amazing benefits that Chiropractic adjustments deliver to all aspects of human performance. Despite the statistics, the majority of people take drugs for pain relief because they are marketed and sold as the solutions. Pyatetsky Family Chiropractic located in Hermitage, PA has the knowledge and procedures to increase your health and decrease your pain.